A Walleye & Large Mouth Bass Fishing Contest for the Whole Family! The 2019 Dates are May 10th – 12th! CLICK HERE to view the rules for the 2019 Treeland Challenge! CLICK HERE to view the brochure for the 2019 Treeland Challenge! CLICK HERE to view/print the entry form for the 2019 Treeland Challenge! THURSDAY, MAY 9TH — WELCOME ALL ANGERS! 7pm – THURSDAY WITH MAX! Get the latest on the Chippewa Flowage fishery from Max Wolter, WDNR fisheries biologist. Treeland Resort. 9pm – DOOR PRIZE DRAWINGS – Treeland & Pat’s Landing, must be present at either location to win. FRIDAY, MAY 10TH — LET THE GAMES BEGIN! 6am – 11am & 4pm – 9pm – FISHING & FISH REGISTRATION. Treeland’s & Pat’s Landing. 11am – 12:30pm – FISH FRY FRENZY – Treeland only. Enjoy our tasty Fish Fry/Shore Lunch at a Great Price, includes dessert! $10! 1pm – DOOR PRIZE DRAWINGS. Treeland & Pat’s Landing, must be present. 8pm – 10pm – HAPPY HOUR – Discounted Drinks & Appetizers. Treeland’s & Pat’s Landing. SATURDAY, MAY 11TH — CAMARADERIE TIME! 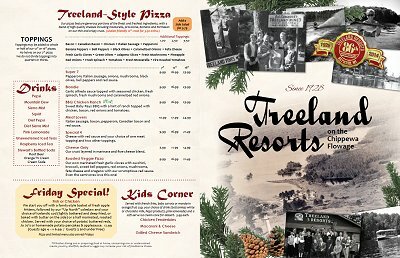 11:30am – 1pm: BRAT & BEER FEED – Included at Treeland Resort. 1pm – DOOR PRIZES – Treeland Resort – Must be present to win. SUNDAY, MAY 12TH — PICNIC, PRIZES & PAY-OUTS! AND HAPPY MOTHER’S DAY! 6am – 10am – FISHING & FISH REGISTRATION – All fish must be in by 10am. CLICK HERE for a recap of the 2018, 34th Annual Challenge! Book your fishing group today! Check Availability here! Rent a boat! Enjoy the camaraderie in the bar & restaurant!